This week our theme was FEATHERS! RJ: Chopstick Feather, found object. RJ would laugh and tell you how he just did something spur of the moment so he would have something for this week’s challenge, But what RJ won’t take credit for is the creativity that one needs to think about transforming what most would see as an insignificant piece of trash – chopstick wrappers – into a piece of art. There is the clear environment aspect of this image. The recycling of materials, the affect that our everyday trash has on the environment and our neighboring species and then there is the ephemeral aspect of the piece itself. This is a photograph documenting something that no longer exists – much like the mid century Art Happenings – and it eerily feels like a documentation of a now extinct species. A reminder that existence is ephemeral. 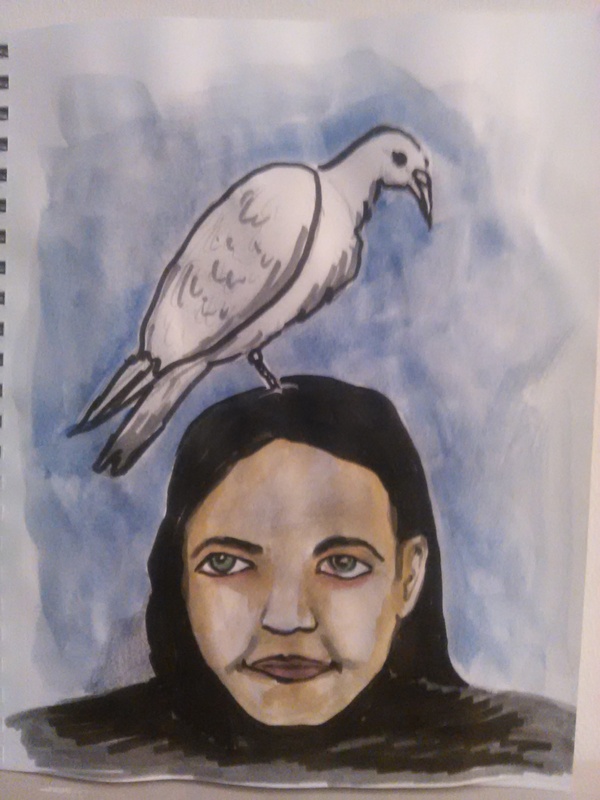 Karri: White Pigeon, Watercolor on paper. What an exciting experience and beautiful image! I love the transparent softness of Karri’s watercolors, they inspire the viewer to want to reach out and embrace the pigeon, and be apart of this moment. Karri’s use of color emphasize the gentle innocence of the moment and the childlike glee of being chosen by the pigeon. Beautifully done! 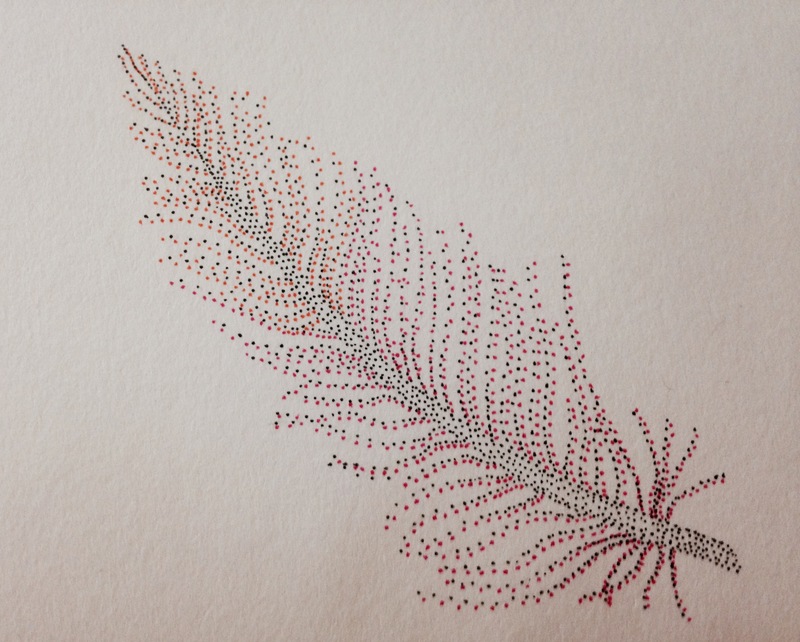 I think the dots were a smart choice and that Emily did a fantastic job capturing the delicacy of a feather. 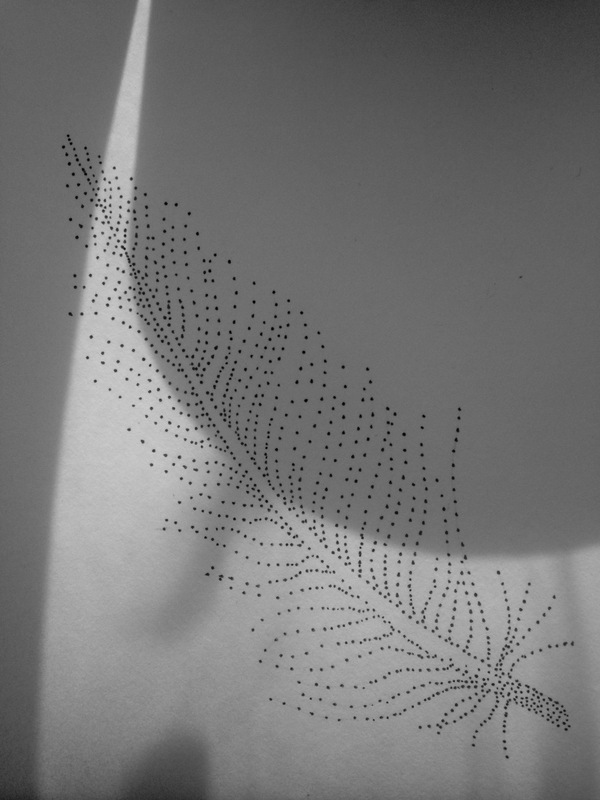 The black and white image has an ephemeral softness to it, like any moment the wind will come and the little dots will scatter across the page. The more colorful feather, while still retaining the essence of a soft texture, express a vibrant charge of energy, like a dramatic movement is about to occur. Beautiful! Amber: The Unconfined, Pen and ink with graphite on paper. For me the most obvious association with feathers is freedom. Originally I had in mind an image of a sleek cat staring nonchalantly outward at the viewer while standing within a pile of loose feathers. 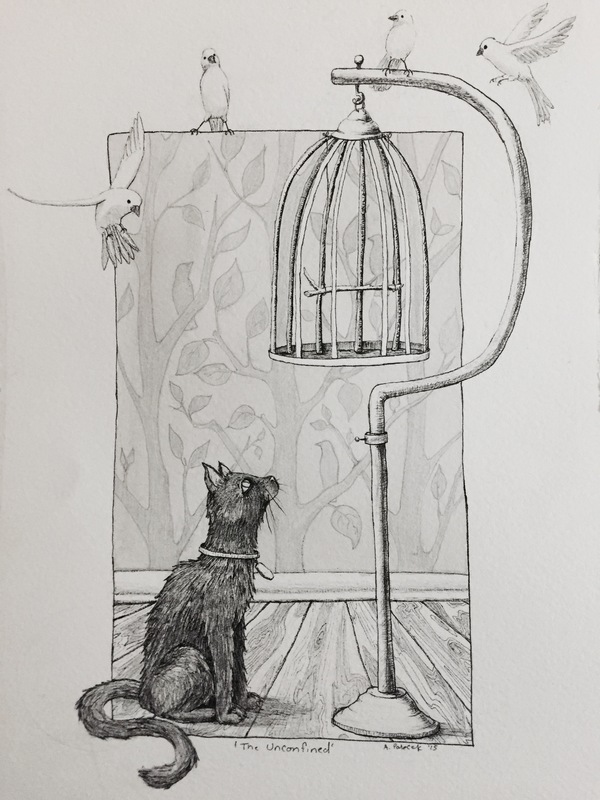 Somehow the image evolved from a confident predator capturing his prey to the prey confidently expressing their freedom from control and fear of the cat and cage. I had thought about including a reference to the Greek myth about Icarus by including a version of him inside the cage; but, shortly after I started the basic sketch of the image, I felt that an empty cage worked better with the idea. I chose Canaries because they are a common bird found in cages and I had recently read that they are symbolic of freedom, which seems rather ironic.